Evil doctor from another dimension entered yours and you have to stop him. Kill Normbots and pick up their gear to use it. Get ready to stop nasty waves of Normbots and their commander from another dimension. Can you do that without letting many robots pass through? 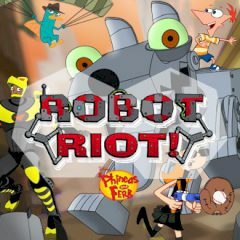 Games Similar Phineas and Ferb Robot Riot!